God on the throne surrounded by the seraphim. Angels call God Holy. They bring release from sin; God asks who will go. The prophet is unworthy, but says “Send me”. *Recorded Music Sweetest Mystery (Malcolm Gordon) Lovely. Probably something more for a soloist unless your congregation knows this already; you could also invite people to simply join in the chorus. "Holy holy holy Lord, is the God who raises us to this family of love". Sound sample and sheet music. AoV2-015 / Iona (M&G) / CH773 / MV189 / StJ / ELW529 / SFFS 2273 / GtG392 / G(II)502 / GC705 / SP&P044 / W&R659 / ZSS148 / StF027 Jesus we are here / Jesu Tawa Pano (Patrick Matsikenyiri / Zimbabwe) Simple and fun. Much better in the original Shona text (rhythmically speaking) but works OK in English. Good for kids. TiS 658 / AoV1-090 / ATE 296 / CH251 / UMH593 / VU509 / WoV752 / ELW574 / GA496 / A&M494 / HPP541 / GtG069 / PH525 / G(II)492 / GC(II)671 / G(3)777 / CP(E) 470 / W&R559 / Cha452 / Srce328 / Lau865 / StF663 / MP857 I the Lord of sea and sky / Here I am Lord (Dan Schutte) Song of God searching for us and our response. Very slow sound sample. Lyrics and sample sheet music. 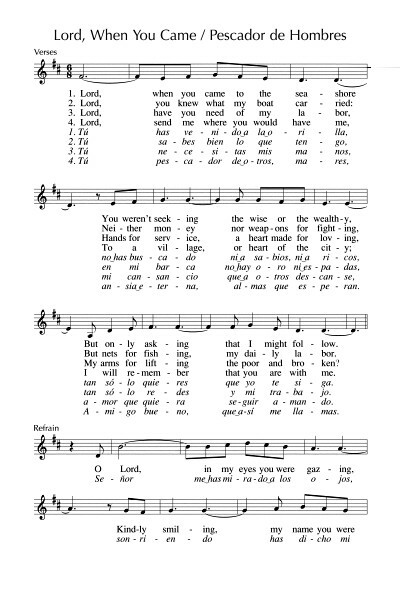 *GtG596 You are holy you are whole (Per Harling) An adaptation of the above song - the last few lines have been changed to say "Sing Hosanna in the highest, sing Hosanna, sing Hosanna to our God"; makes it much more like a Sanctus. Lyrics in English. Good for kids. You might also like to sing a "Holy Holy": Here's a list! NCH Psalter 138 Great is the glory of God (Emma Lou Diemer) A very simple refrain for a chanted (or read) Psalm. *Unknown Source I lifted my voice and spoke your name, your word of answer swiftly came (Linnea Good) A very simple congregational response to the Psalm being spoken. It would be great to do this. Need a confident reader who can preferably lead the singing, or an attentive musician to come in at the right spot. Good for kids. 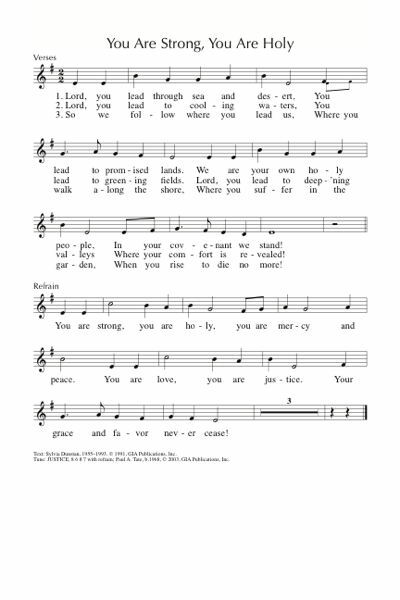 GC(II)700 / G(3)799 Lord you lead through sea and desert / You are strong you are holy (Sylvia Dunstan) Simple version of this psalm with a strong chorus. I don't know if our congregation would like it though. Sheet music. Sound sample. TiS 86 / Srce793 With my whole heart I will praise you O Lord (Arlo Duba) This refrain is fine. Verses should be read, perhaps while playing the chords in the background. Make sure to keep the chord quiet enough so they are not too distracting. CH348 / StS001 / LBW196 / ELW843 / A&M762 / G(3)625 / CP397 / W&R93 / SP304 / URW090 Praise the One Who Breaks the Darkness (Rusty Edwards) Good words of Christ's ministry to all. Can be sung to the familiar tune NETTLETON, or the less familiar and very lovely tune JOEL. Lyrics and sheet music sample. New words to old tunes. NCH231 / VU178 / AA007 / PH105 / GtG249 / W&R292 Because you live O Christ (Shirley Murray) Excellent words to the well known Easter tune VRUECHTEN. AA has it set to CRAWSHAW which is less familiar. Lyrics. New words to old tunes. TiS 387 / CH416 / UMH318 / VU158 / PH108 / LBW363 / ELW389 / A&M199 / GtG246 / PH108 / CP(E) 140 / W&R312 / 82Hml-182 / Lau272 Christ is alive Let Christians sing (Brian Wren) Excellent words of Christ's saving, and still relevant grace. 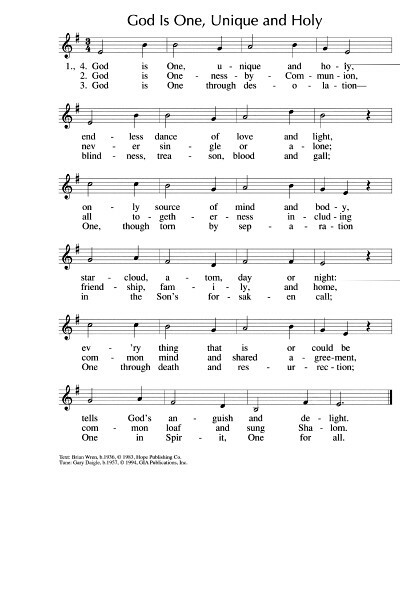 A couple of tunes are offered in different hymn books. I prefer TRURO. Lyrics, sound sample and sheet music. The risk of going into the deep, as the disciples who followed Christ. Online Resource / Tune In Hail the fisherfolk (Dave Brown) A bluesy litany of the saints, including the fishermen of yesterday and the fisherfolk of today. This song celebrates the many people who have followed God’s call through the ages. Lyrics, sound sample and free songbook. 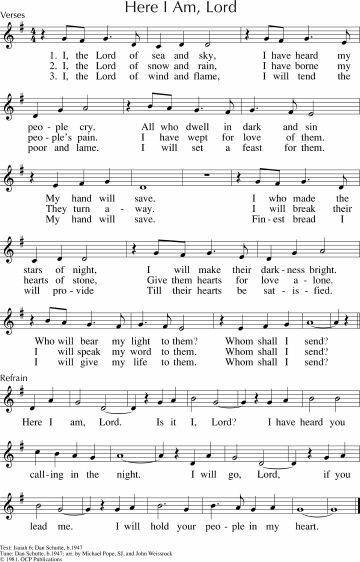 CH340 When Jesus saw the fishermen (Edith Agnew) Simple words about the calling of the fishermen, set to a traditional carol tune (THE SEVEN JOYS OF MARY). New words to old tunes. NCH173 / CH532 / UMH344 / VU563 / WoV784 / ELW817 / HPP324 / GtG721 / PH377 / G(II)500 / GC696 / GC(II)678 / G(3)781 / W&R347 / Cha342 / Lau871 Lord, you have come to the seashore / You have come down to the lakeshore / Pescador de Hombres (Cesareo Gabarain) There are many translations of this song. I like the NCH version best as it's most inclusive. The song can get a bit shmaltzy, but the tune is a nice lilting one and the words are great. “On the sand I have abandoned my small boat; now with you I will seek other seas”. Sound sample. Lyrics and sheet music. NCH504 / StJ / HPP545 / GtG170 / GC(II)679 You Walk along Our Shoreline (Sylvia Dunstan) Good words to a very familiar hymn tune (AURELIA). 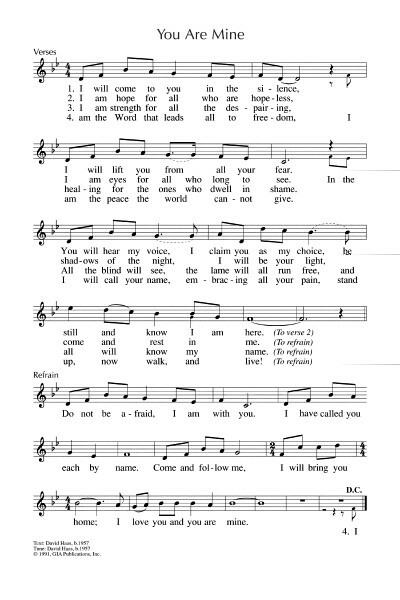 Sound sample, lyrics and sheet music sample (search for "you walk") New words to old tunes. TiS 589 / AHB 505 / NCH171 / CH509 / UMH398 / VU562 / LBW494 / ELW696 / HPP314 / CP432 / CP(E) 233 / W&R345 / Cha337 / 82Hml-550 Jesus calls us; o'er the tumult (Cecil Frances Alexander) Great words. TiS sets it to ST CATHERINE, but it could be sung to other tunes (like STUTTGART) if this is not familiar to your congregation (it’s not hard though). New words to old tunes. Online Resource / Tune in We are the dream that's longing / Jesus is waiting (Dave Brown) An honest catchy rock song about our hesitation to follow and Jesus not only waiting, but continuing to work and change the world. A good sending-out song. Lyrics, sound sample and free songbook. Gospelling to the Beat One man was Peter he lived by the sea (Llewellyn) A simple kid's song "stop what you're doing and follow me!" Good for kids. ATOK 348 / Iona (HSNW) / G(II)496 / GC692 / GC(II)697 / StF462 Come with me / Sing hey for the carpenter (John Bell) Excellent. I love this one. Very joyous, and a big favourite in our congregation. Lyrics. Good for kids. TiS 242 / AHB 183 / AoV1-018 / ATN 27 / CH404 / UMH261 / VU352 / A&M667 / HPP163 / GtG157 / PH302 / G(II)481 / GC708 / GC(II)689 / G(3)796 / CP(E) 468 / W&R118 / Lau765 / StF247 I danced in the morning / Lord of the Dance (Sydney Carter). Lyrics and some facts. “I danced to the fishermen, to James and John….”.You all know this one, right? Good for kids Oldy-but-a-goody. SFFS 2101 / G(II)301 / GC688 / GC(II)693 / G(3)798 Two Fishermen (Suzanne Toolan) A nice medieval / minstrelly sounding tune and good words. This would be fun. Lead sheet. Sound sample. What happened to the old song, "I Will Make You Fishers of Men." After all, men did most of the fishing in Jesus' time. Moreover, Jesus lived in a patriarchal society. Why the need for being "PC"? I like the song. The kids like the song. 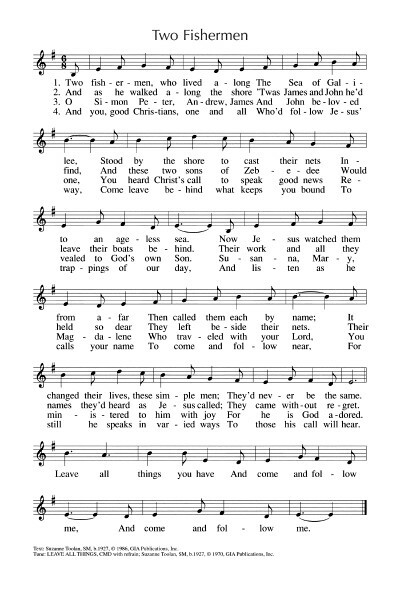 My Sunday School Class loves the song, My female Sunday School teachers and youth leaders don't seem to have a PC problem with this beautiful song. "Pastor Darryl"
Jesus saw them fishing by Ken Caneda MV 113. A really fun tune and good scriptural words. Hi Pastor Darryl, I don't really know the song "I will make you fishers of men". I don't think it's really relevant that men did most of the fishing, because in that song Jesus is not talking about who is fishing, but who will be "caught". Kind of boring if only men get caught, don't you think? I think that singing songs that include all people is important for our churches to model how Jesus welcomed all people into his community. It's not a matter of being "PC", it's a matter of encouraging all people to know that they are welcome to be part of God's mission. No-one is stopping you and your community from singing that song. The point of this website is to provide songs that are more inclusive and sometimes harder to find.